It may not be as fascinating as it was in that first season, but A&E’s “Bates Motel” is still an entertaining drama, grounded by two excellent performances from Vera Farmiga and Freddie Highmore. Since “Bates Motel” became a hit, the network has been trying to find the right partner for it. The quest for a dance partner for Norman Bates has brought them to another show based on a horror classic, “Damien,” based on the 1976 hit “The Omen” (and wisely ignoring sequels and remakes of that film). In that film, Damien Thorn’s father (Gregory Peck) became convinced that his son was a tool of the devil. With reports of Satanism on the rise in an increasingly crime-riddled world, “The Omen” struck a nerve in the mid-‘70s. The TV version joins a landscape absolutely dominated by horror programming as everyone tries to find the next “Walking Dead.” “Damien” is not that show. It is a show in search of the right tone, littered with laughable dialogue and a notable uncertainty of what it’s supposed to be. The horror doesn’t work, the characters aren’t defined and the plot is ludicrous. You’d be better off watching one of the “Omen” sequels. Damien (Bradley James) is a conflict journalist, who we meet in Damascus, one of the most violent parts of the world. As he’s working with colleagues (including a buddy played by Omid Abtahi and an ex-girlfriend), violence erupts. Damien is grabbed by an old woman who knows his name and even quotes the line from the film, “It’s all for you, Damien,” which the child’s governess said before throwing herself from the family roof with a noose around her neck. Her eyes go white and she “gives” Damien flashbacks to a childhood that he has apparently regressed. It also happens to be Damien’s 30th birthday (don’t do the math on the movie’s release date of 40 years ago), the same time of life in which Jesus was reportedly baptized. Damien is a little confused. And I really mean “a little.” “Damien” is one of those shows in which ridiculous, supernatural, definitively insane things can happen and people look at each other as if they got a text from a wrong number. When Damien says, “This is why I left, Kelly. I couldn’t drag you into this,” I couldn’t help but laugh. This? You mean the end of the world? Being a tool of Satan? Methinks you’re underplaying the situation a bit. A vast majority of the dialogue in the premiere of “Damien” comes from this school of melodramatic soap opera. It would sound at home on “Blood & Oil.” And the atrocious lines aren't even in the so-bad-it’s-fun department because the producers of “Damien,” including the typically-sharp Glen Mazzara of “The Walking Dead” and “The Shield,” take the whole thing so seriously. The producers of “Bates Motel” brilliantly know when to put their tongue in their cheek. “Damien” thinks it’s a serious drama about killer Satan dogs. It doesn’t help that the cast, especially James, is so dull. Reportedly, “Deadwood”’s Robin Weigert and “The Walking Dead”’s Scott Wilson show up in future episodes, but I can only judge the premiere as that’s all I’ve seen. Barbara Hershey does enliven the proceedings in one scene as a mysterious overseer for Damien, but her scene is the only one in the first episode that crackles. 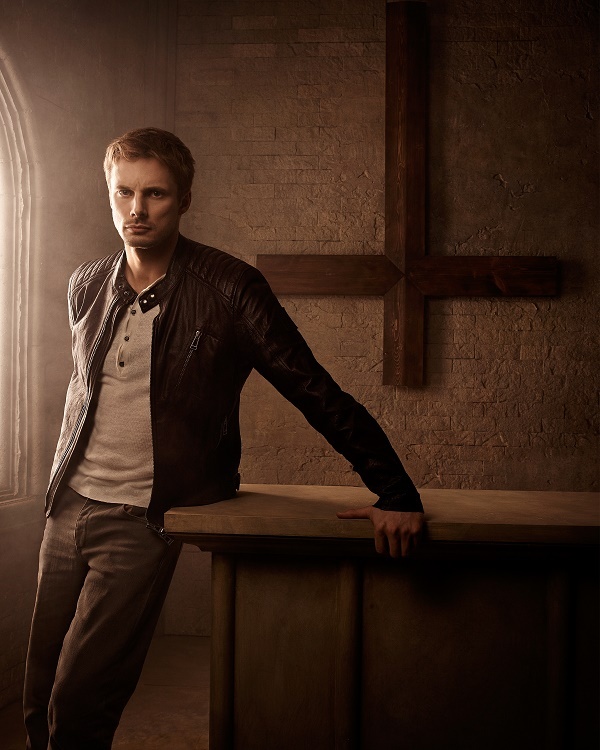 It’s interesting to see a show like “Damien” that embraces its source material—even using clips from it—instead of rebooting or reimagining them. It’s a very direct sequel, which is rare, and its ancestor certainly took itself seriously as well, although Bradley James is no Gregory Peck. And these callbacks mostly serve to show how shallow “Damien” is in comparison. It feels like “The Chris Farley Show” of horror programs—remember “The Omen,” wasn’t it awesome?